Brooke Di Francesco. Photo by Thomas Palmer. As children, we crave magic. We are easily enchanted as we discover more and more about the world. We believe in things that adults laugh off, knowing to be untrue. Unlike Peter Pan, however, we have to grow up. Life happens, hearts and dreams are broken, and our innocence shrinks smaller and smaller. But that ability to dream, to believe the unbelievable, is the seed of creativity and innovation. And it’s cathartic, buffering us from the harsh realities of a dog-eat-dog world out there. The Nutcracker, a beloved holiday tradition, builds a world in which even adults can experience magic again. 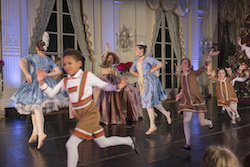 Island Moving Company (IMC) fully capitalized on this quality in its 16th Annual Newport Nutcracker at Rosecliff. Beginning this sense, the show opened with Drosselmeyer (John Carr) and Winter Fairy (Lauren Difede, seemingly the Snow Queen in an expanded role). IMC’s ‘Newport Nutcracker at Rosecliff’. Photo by Thomas Palmer. Children filed in on the stairs, looking up to see their parents enter. All were elegant and poised. Costumes by Eileen Stoops were beautifully ornate, yet naturalistic. Then these characters guided the audience into Newport’s Grand Ballroom. The multiple Christmas trees sparkled, and music boomed through the room. The children demonstrated both the professionalism of adulthood and the present joy of youth. There were sweet moments between the dignified adults and their children – such as high lifts, bringing them eye to eye, while children picked up their heels. This performance utilized parent/child relationships more than many Nutcracker presentations do, to great effect. It all felt authentic and immersive, like the story played out on a proscenium stage cannot. One would have to be Ebenezer Scrooge to not be pulled right in. 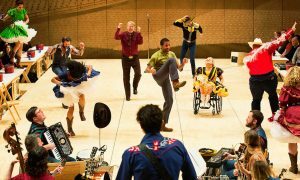 One’s feet wanted to waltz right along with the parents, in their stunning quartet, and spin along with Tess (Clara given another name in this production, Madeline Kment) in her commanding presence. Hermann (Fritz in another name, James Enright) was rough-and-tough in a way that was perfect for his character. Ballerina Doll (Tara Gragg) and Soldier Doll (Glen Lewis) were strong and precise, yet didn’t lose the sense of playful magic at the root of their characters. These characters moved us to another room to enjoy the next festivities – as happens in classic dinner parties of the well-to-do. Drosselmeyer and Winter Fairy moved around and through the crowd, evidently orchestrating the magic like a seasoned conductor does an orchestra. Drosselmeyer foreshadowed the mice coming, gesturing paws and whiskers. He once spun and was caught by a parent, offering a bit of charming humor. Yet he was also spurring the mysterious events to unfold; as the mice arrived, he seemed to call the Rat King. Another part of the magic were little ways the show was its own Nutcracker, apart from the many, many other Nutcrackers running this season (and every season). The Party Scene boys had swords rather than instruments, for instance, and one of parent couples was Mr. and Mrs. Vanderbilt (the historical owners of Rosecliff). The children threw blocks of cheese at the mice, a warmly funny addition to these characters’ incorporation. The story progressed to the Snow Scene. Lauren Difede. Photo by Thomas Palmer. The little Snowflakes, in addition to the larger ones, were another nice variation that this year’s IMC Nutcracker added. They were part of sweet moments, such as making a tunnel for Tess. She ran through, and they spun as she passed. Again, only the Grinch wouldn’t be touched. The bigger Snowflakes (seemingly teenaged dance students) moved with power and punch, yet also softness and grace – at an impressive level for their apparent age. In some magical train of thought, they learned it from Winter Fairy, who led them all in offering these qualities. The Angels welcomed all into the second act, in beautiful white Empire dresses. 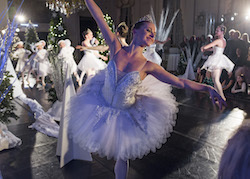 Sugar Plum (Brooke DiFrancesco) entered, offering extensions that traveled for days – yet also something subdued, as if she was holding back to roll it out later, to build an intriguing mystery about her. It was all part of the whole show’s magic. Her Cavalier (Darwin Black) offered strong, yet soft and easy lifts – in the ballet cliché, making something hard look like nothing of the sort. Again, all part of the magic. Then to the Land of the Sweets variations. 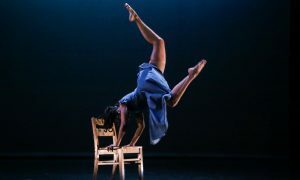 Spanish Chocolate (Katie Moorehead and Lewis) came in with a burst of energy, smooth in the blend of their character flourishes and more technique-based movement. The Chinese Tea soloist (Timur Khan) was filled with joy and bright ballon. It was very encouraging to not see the “chopstick” fingers, a traditional Nutcracker inclusion that some critique as culturally insensitive. Russian Candy Canes were another variation that included Newport Academy of Ballet students in a way that added warmth and further magic. The children stomped and leapt as Dwayne Cook and Gragg offered more technically advanced movement in center. The two were both light and strong in very challenging leaps and turns. Difede as the Arabian Coffee soloist was silky smooth and billowy in her movement, yet solidly unshakeable, just like the silks with which she turned and extended. Tarantella had further children dancing clear, simple choreography in ways that were crafted to remain interesting and pleasing – such as in circling and up/down movement (utilizing many dimensions in space as well as levels). With all of the complex choreography traditionally in The Nutcracker, and this presentation as well, there’s also beauty in something more pared-down! Tara Gragg and Vincent Brewer. Photo by Thomas Palmer. Unto the flowers the plot progressed, led by Dewdrop (Moorehead) and King of the Flowers (Shane Farrell). Moorehead moved with a graceful lilt like that of the flowers she embodied, and Farrell with wonderful carriage of lifted, focused épaulement and gaze. The whole audience applauded their smooth shoulder-sit lift. The younger flowers also offered the softness and ease of flowers, yet with a groundedness allowing them to truly fill the space. The Grand Pas followed – a treasured Nutcracker staple. DiFrancesco fueled Sugar Plum through the magic of the movement and her own grace – no “muscling” involved. Black’s Cavalier came with raw power, yet also a warmth right up to his mile-wide smile. Their time to shine closing, the full cast came back for finale. It was more than just a few joined movement phrases bows; solos and small groups gave separate characters fun reappearance. After a final full-cast section, two semi-circles moving into lines, Sugar Plum returned the Nutcracker doll to Clara. Drosselmeyer returned to stand by Clara downstage left, while Sugar Plum and Cavalier stood facing them from upstage right (creating a diagonal). The two pairs waved to each other as the lights dimmed. There was a sense that the magic could continue – if we want it to, and allow it to. This holiday season, amidst the stressors and realities of modern life, let’s not forget to remember the magic. Thank you to IMC for bringing that important reminder to life in this production. 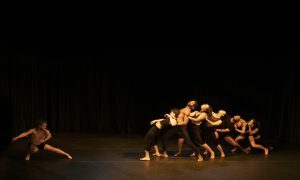 Arch Contemporary Ballet’s ‘Between the Lines’: Draw outside your own!